Automat, Distortion from Palmer in the Root Effect series. 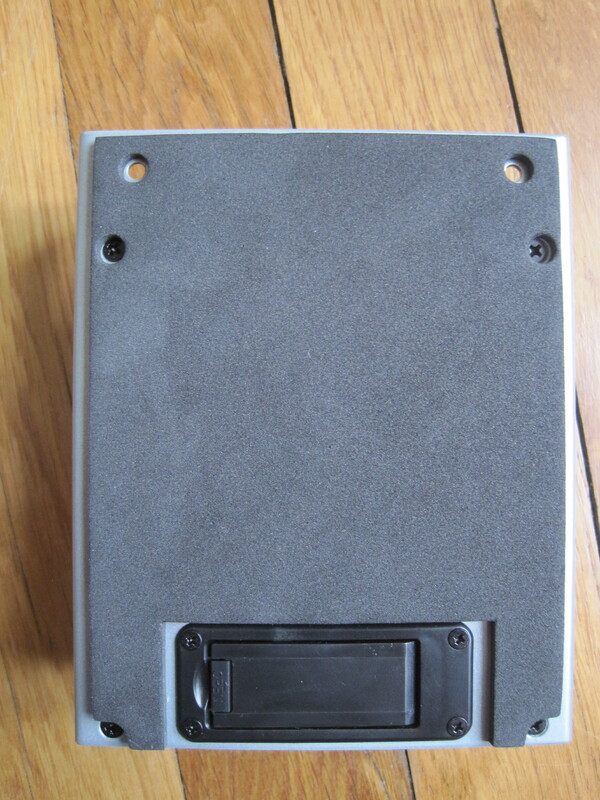 The Automat shares the same dimensions (4.7" x 2.4" x 5.9") and housing (although brown) as the Timepressor, with all its advantages and disadvantages. 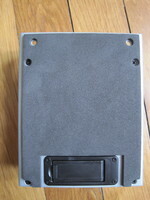 It has a metallic base with two holes at the height of the input and output jacks, in order to be able to screw it down to a pedalboard, and this also serves to protect the cables from the sides and above. 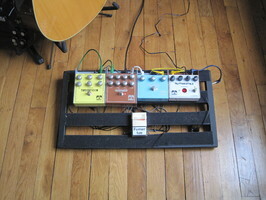 The inconvenience of this arrangement is that it makes it hard to use right-angle plugs to link it to other pedals: considering the miniaturization of pedals and that ours is already big enough, this protection system will make us lose even more space due to the connections. It certainly won't be a favorite of people who like to travel light, especially considering it weighs 2.2 lbs! 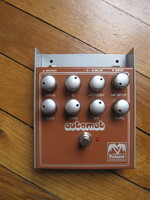 The Automat features eight metal potentiometers and a sturdy looking switch. The jack inputs are also made of metal, which says a lot about the reliability of its manufacturing. All things considered, it gives the impression of being able to take a lot of abuse. On the bottom, the pedal has a big and trusty non-slip pad and a 9V battery compartment. If you don't like to use batteries, you can use the power supply connector right next to the INPUT. The red LED to the right of the footswitch indicates the activation of the pedal, as well as the battery life. Finally, inside the box you will find the manual in several languages and two picks (a nice surprise). 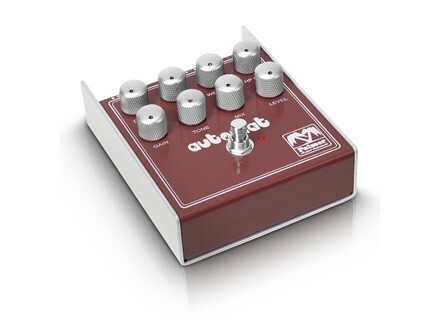 As already mentioned above, the Automat is a pedal that combines an auto-wah (which oddly resembles the Q-Tron of a competing brand) and distortion. The latter is the same as that of the yellow pedal in the Root Effects collection that goes under the "original" name of... Distortion. Each effect has its own row of controls, or at least part of one. The bottom row is partly dedicated to the distortion. At the far left you have the Gain pot, to adjust the level of the distortion, and Tone to change the color of the sound (dull or brilliant). Finally, the two other pots are global controls: one serves to Mix the two effects, while the other one determines the overall output Level. 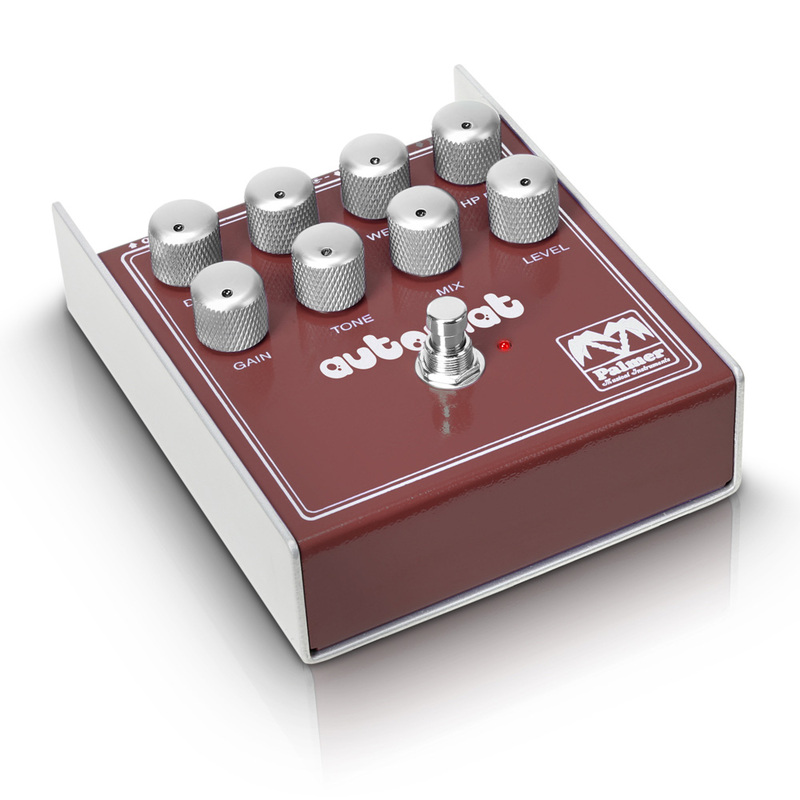 We regret the absence of a second footswitch to activate the effects independently, which would've made it an unquestionable 2-in-1 pedal. To give you an idea of the numerous possibilities that the Automat offers, I plugged my Fender Telecaster Deluxe to a Mesa Boogie Triaxis/2:90 combination and a Two Notes Torpedo Live. 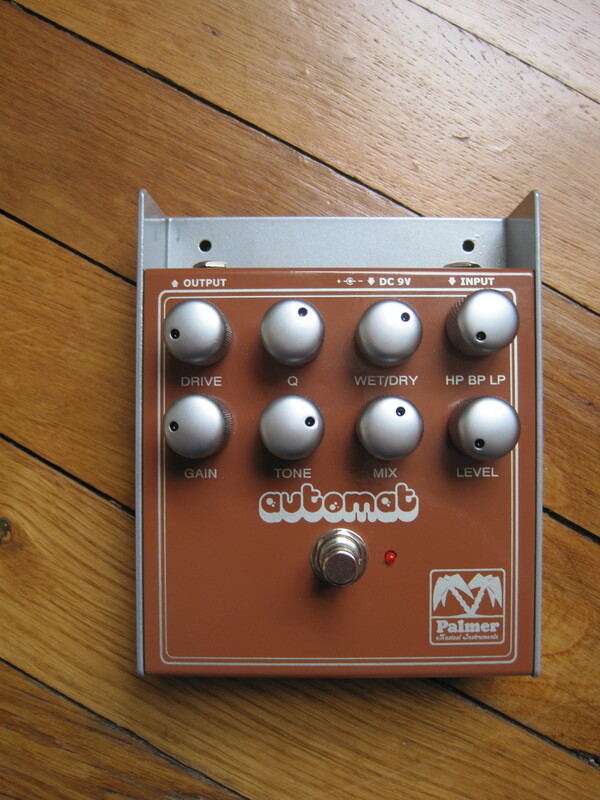 Let's start with the auto-wah and classic settings: Drive and Q halfway, Wet cranked all the way up, and an HP filter (the Mix and distortion sections were bypassed manually). Then, for the next two examples, we changed the filter type (BP and LP) to assess their impact on the sound. 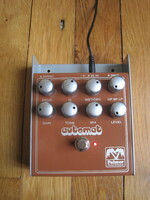 As you can observe, the Automat boosts the frequencies enough to make the clean sound distort a bit. The filter choice will depend on the instrument and type of pickups used. For the next three examples we focused on the Drive control. 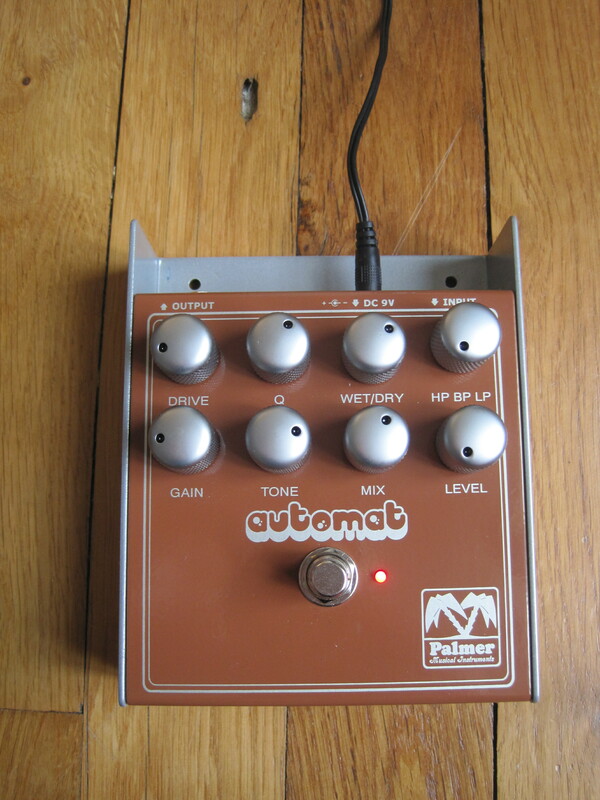 On the first example, all auto-wah parameters are set to max. I played the two middle strings with the Drive pot at 0 and turned it all the way up, with stops at 1/3, 1/2 and 2/3 of the travel. Then you have a reggae riff with the pot set to 0, 2/3 and 3/4, and a short, jerky melody with a band-pass filter (BP) and everything else cranked all the way up, except for the Drive, which is set to 2/3. The drive effect makes itself evident at about half the pot's travel and onwards. And even more so when the pick attacks are sharp (especially with low sounds), since the pedal reacts to the playing dynamics. We then went on to examine the distortion with examples 7-11, manually bypassing the filter section and the Mix. 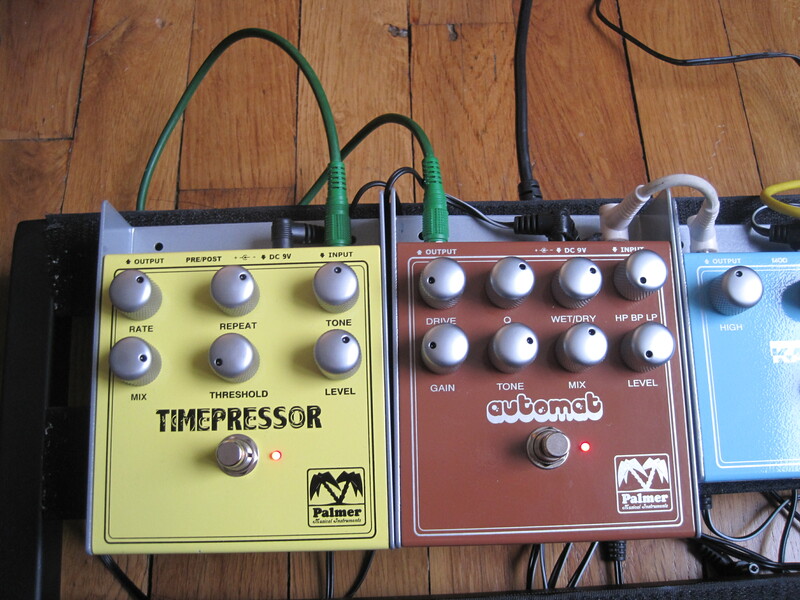 First off, two examples with Tone halfway and GAIN set at 1/3 and then at 2/3. On the third example we focused more on the behavior of the Tone pot, starting at 0, then 1/3, 2/3 and all the way up, with the Gain always set at 2/3 of the travel. Next, a riff where I combined both effects and used the filter to boost the high-mids and the highs to get a SRV-like sound (quickly dialed in). When everything is cranked all the way, the Tone can hardly be brought halfway up before it starts generating feedback, which you can hear in example 11 (watch your ears...). 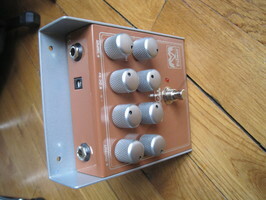 The distortion is not bad at all, and can go from a nice crunch to a pretty wild saturation. You should use the TONE with caution. When turned beyond the half-way point, it makes the sound very shrill and "synthetic." To finish, the last three examples show the surprising results you can get mixing both effects (the MIX control is all the way up). Example 12 is a neutral mix with all parameters dialed to 12 o'clock. Example 13 shows an amusing effect with TONE set to 0 and the rest cranked to the max with a bandpass filter. The last example, à la Daft Punk, shows that you can even get a modern electro-funk sound with the pedal. The sonic possibilities offered by the Automat are pretty large, but it will certainly take some time to master all aspects. 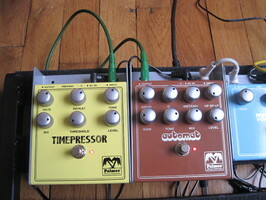 Considering that this pedal has a street price of under $120, you have a 2-in-1 pedal with a very interesting value for money. Its sturdiness and reliability will make us forget its size, weight, and some inconveniences inherent to its design. Don't be mistaken, despite its German origins, it will make your funky and disco rhythms groove like crazy. After all, wasn't Boney M German?